Alton Towers has reopened some of its rides that were closed as a result of the accident on The Smiler rollercoaster. The X Sector area of the park – where the Smiler is located – reopened today, although the ride itself remains closed. The Oblivion and Enterprise rides reopened following the ending of the Health and Safety Executive (HSE) inspectors examining the adjacent Smiler site. 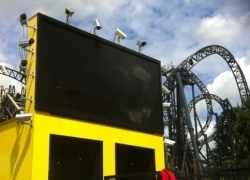 The Smiler has has had references to its logo and name removed from the ride, which follows the removal of Smiler-branded merchandise from Alton Towers’ retain outlets. It is not known whether the park will re-launch the ride as The Smiler, however Ride Rater understands that the rollercoaster will not operate again this season. The Sonic Spinball ride has also re-opened, as has its sister rollercoaster Dragon’s Fury, located at Chessington World of Adventures in Surrey. Meanwhile, the Nemesis Sub-Terra attraction remains closed for a third week, due to what Alton Towers describes as “design changes”.